Federal Small Business Agencies are listed first, followed by the state Small Business Development Centers listings. State specialty food associations have a separate listing in the Resources section. The Code of Federal Regulations (CFR) con­tains the specific laws governing labels and ingredient statements for food products. Copies of the appropriate chapters may be purchased from your local government printing office. The SBA provides business counseling and has a government-guaranteed loan program for small businesses. You can only qualify for such loans if you have been refused by your local bank. Don’t hold your breath. Very few food entrepreneurs are able to access these funds. Ask for the address of the regional office nearest you. Founded in 1964, this all volunteer, non-profit association with 389 chapters throughout the United States and Territories, offers free advice to all entrepreneurs. It is a valuable resource partner with the Small Business Administration and offers free consulting and low-cost workshops to prospective and current entrepreneurs. Please visit their web site at www.score.orgto research various topics such as Business Planning, E- Business, Finance & Capital, Human Resources, Leadership, Legal, Marketing & Public Relations, Office Management, Sales & Customer Service, Taxes and Training and to receive advise with a matched mentor. The U.S. Small Business Administration (SBA) administers the Small Business Development Center Program to provide management assistance to current and prospective small business owners. SBDCs offer one-stop assistance to small businesses by providing a wide variety of information and guidance at centrally located branch locations. Not all states have a listing for a specialty food association. Please check with that state’s Department of Agriculture for guidance. The Maryland District Office does not serve Montgomery and Prince Georges Counties. Please visit the Washington, D.C. District Office for assistance. There are 9 regional offices throughout the state. 400 South 4th Street, Suite 250. 601 SW Second Avenue, Suite 950. 252 Ponce de Leon Ave.
222 East Van Buren Avenue, Suite 500. You can forget about any substantive mar­keting assistance from this department. Food marketing (domestic and interna­tional) is not conducted by the DOC. Check instead with the Department of Agriculture and its Foreign Agricultural Service. 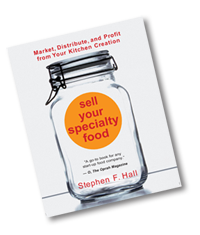 Request a free copy of information on how to start a food business. The Website con­tains a lot of information, including a Food Labeling Guide. The Web site will get you to a complete list­ing of all state departments of health. These include food safety sections.